Alfred Middleton Blackwood Rose-Cleland was the only child of Henry Somerville Rose Cleland and Elizabeth Anne Rose-Cleland. He was born about 1895 in County Tyrone. Alfred was educated at Dungannon Royal School and Columba’s College, Dublin. Alfred’s father was a linen manufacturer. 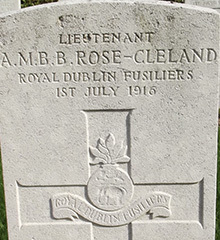 Alfred Rose-Cleland was working for the building firm of McLaughlin and Harvey on a contract in Essex, England, when the war started.Alfred returned home to enlist in the 9th Royal Inniskilling Fusiliers. Alfred then became Lieutenant in the Royal Dublin Fusiliers. 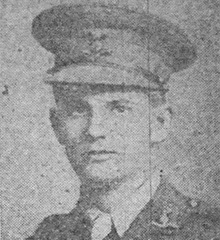 Lieutenant Alfred Middleton Blackwood Rose-Cleland was killed in action on the first day of the Battle of the Somme on 1st July 1916, age 21. 6 War Graves Photographic Project Photo of Arthur Rose-Cleland headstone can be purchased here.